One of the first laptops employing Nvidia's new Q-Max design. It's only 0.65 inches thick! With those hard titanium Powerbook G4-like edges, the Zephyrus calls to mind its boxy forbearers, yet it’s so much thinner than any laptop of its power-level that’s come before. At 0.65 inches, it’s actually only a little thicker than the much less powerful .61-inch thick 15-inch MacBook Pro, and a whole lot thinner than a cheap 15-inch gaming laptop like the 1-inch thick Dell Inspiron 7000. It’s also more than half the thickness of Asus’s last gaming laptop with a Kaby Lake processor and Nvidia 1080 GPU. The average thickness of previous Asus gaming laptops with similar specs? 1.36 inches. 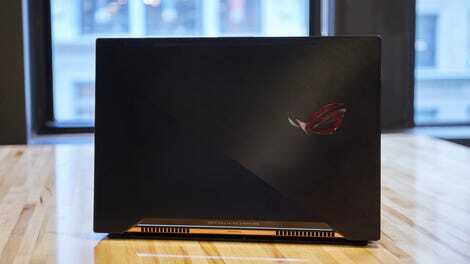 Beyond that remarkable thinness, at a glance, nothing seems to have changed between the Zephyrus and earlier gaming laptops from companies like Asus, MSI, and Acer. There’s the black brushed aluminum finish and a keyboard lit in garish colors. The Zephyrus adheres to the new fad of removing the palm rest, bringing the keyboard down to the front edge of the chassis and adding a big ugly space between the keyboard and the screen. It makes for an uncomfortable gaming experience, particularly if you try to use the touch pad, which is shunted off to the right. The vent, which is a nightmare for anyone with a toddler who likes to stick things in other thing, supposedly improves airflow to the Nvidia 1080 GPU packed inside. While I can’t confirm that, I can confirm that it makes the bottom of the Zephyrus much cooler. I noticed it as soon as I plopped the laptop on my legs and tried, again, to finish Mass Effect: Andromeda. The device got warm, but never so uncomfortably hot that I had to take it off my legs for fear of causing permanent damage to my thigh meats. This was confirmed when I ran the Civilizations VI Graphics benchmark, with identical graphics settings, on it and my 2016 13-inch MacBook Pro. The Zephyrus, despite having a much more powerful graphics card and CPU, ran five degrees cooler, hitting just 93 degrees Fahrenheit on the bottom of the case. But, as evidenced by the success of most of the current monstrosities labeled as gaming laptops, gamers don’t really care about how gigantic a gaming laptop looks. What they care about is how it runs. 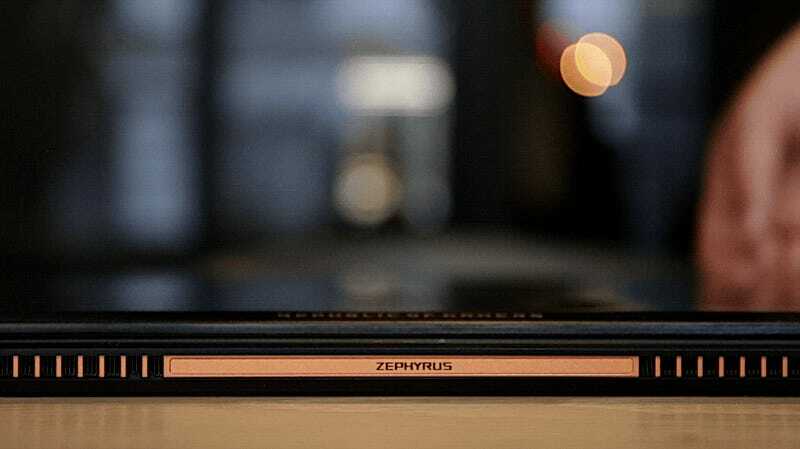 The Zephyrus is a pricey machine, retailing for $2700, and on paper, it’s packed with power. That big price tag gets you a Nvidia 1080 graphics card, an Intel i7-7700HQ CPU, 16GB of RAM, a 256GB M.2 SSD hard drive, and a 15.6-inch display with a 120Hz refresh rate. You could build something similar (excluding laptop chassis) for half the price, or, if you absolutely needed a laptop, you could pick up a 17-inch one with nearly identical specs from Asus or MSI for around $2800. Both would also be about twice as thick. Nvidia GPUs running on Max-Q devices are designed to run at slower speeds, sipping less power and reducing performance so they can maintain their thinness without become scorching hot. The question was how much performance will you lose? If a $2600 device like the Zephyrus only runs as well or a little better than a $900 device like the Dell Inspiron 7000, then its price tag and size start to feel a lot less worth it. What’s the point of spending all that cash if you’re ultimately crippling performance? The Zephyrus, to my delighted surprise, ran really damn fast. While I didn’t have the right laptop on hand to compare the device to performance-wise, I do happen to have a desktop with an Intel i7-7700k CPU, Nvidia 1080 desktop GPU, and 256GB m.2 SSD. So I pitted the two (and a $900 Dell Inspiron 7000) against one another. Unfortunately, there’s a catch, and if you’re eyeing a gaming laptop for extended sessions on a plane, bus, or in any other venue sans power ports, then it’s gonna be a doozy. In laptop design there is always a trade off when it comes to power, performance, and size. If you have a powerful laptop, it is either big enough to hold a giant battery, or thin and light enough you don’t mind tossing it on the couch as you hunt for a charger. A powerful laptop will always fail at one end or the other of this power management spectrum, and the Zephyrus, in its quest to be so incredibly slight, drops the ball when it comes to battery life. I got just a little more than two hours of regular use on the thing. It’s consistent too: Whether I’m attempting to game or just browsing Twitter, my battery disappears very fast. Until that day, we’ve got the Asus ROG Zephyrus. It’s a $2600 laptop that is, by all accounts, the most powerful laptop of its size ever made. If you need a gaming laptop that’s small, powerful, and cool in your lap, and you don’t mind carrying a power supply everywhere you go, then put this guy at the top of your list of potential buys. You’re going to be hard pressed to find another laptop this well crafted and this great at balancing power and size.